Oh I like so much experimenting with new recipes. The one I created today is based on a Chilean dish. 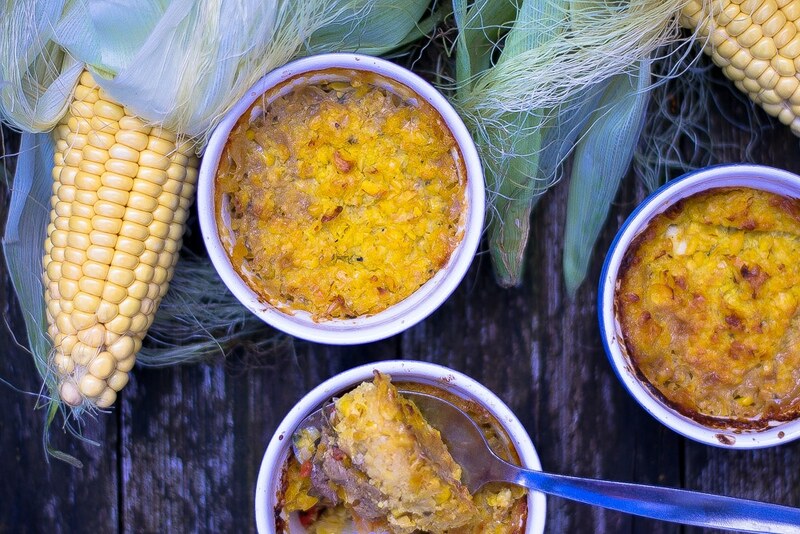 Here is my Corn Topped Chilean Vegan Sheperd’s Pie recipe. Yesterday the Hubby bought 25 ears of corn. I am not kidding you – he is like that! He saw the ears in Tesco and they looked so fresh that he couldn’t resist, and he couldn’t limit himself. In case you don’t know we are 5. And as much as we like corn on the hob, there is a limit to the amount of corns you can eat day after day! So I browsed the web searching for some new ways to use the corn. 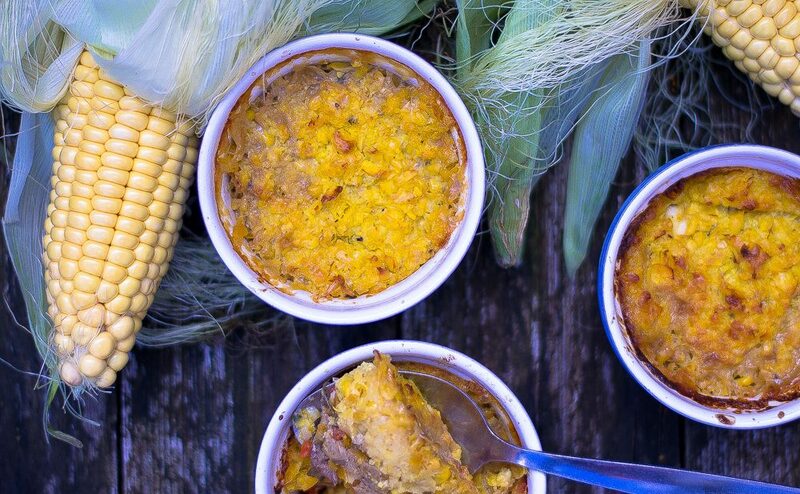 I stumbled upon this Chilean Pastel de choclo and I found it very tempting. I had never cooked anything from Chile – actually I didn’t know any typical Chilean dish at all – so I was very exited at the idea of trying it. Of course I had to do a few changes, as the original dish requires meat and eggs. I decided to omit the eggs. I had bought a couple of jars of Seitan on Amazon and so I decided to give it a try as a meat substitute. But now that I have tasted this dish I can certainly say that you could use kidney beans instead of seitan and it would be delicious as well. The original Pastel de choclo calls for raisins in the mixture and a dusting of icing sugar on the top. I omitted these two ingredients too, the last because I am trying to avoid sugar, and the first because I believe that with carrots and corn the dish would have been sweet enough! The final result reminds me of an Irish Sheperd’s pie, just with a corn topping, and meat free! Chop carrots onion and pepper until they are reduced in little dice. Heat some oil in a pot and add vegetables and garlic. Let them cook for 5 minutes stirring occasionally. Chop the seitan and add it to the pot. Stone and chop the olives and add them to the pot. Add all the seasoning and let it cook for 15 min. Place all the ingredients for the topping in a pot and cook the for about 10 minutes. Remove from the fire and blend them leaving a rough consistency. Place the vegetable and seitan mixture in a ovenproof container and or in ramekins previously greased with olive oil. I have used a 25 cm x 25 cm plus 6 ramekins! Place in preheated oven 200 C for about 20 minutes or until the corn turn golden and it bubbles at the sides. Note: if you want to add the eggs you have to boil 4 slice them and evenly place them on top of the vegetables before the corn topping! Enjoy it with some fresh salad! Thanks for trying my recipe, girl! I love the way you adapted it to fit your needs. This looks delicious! You are very welcome Tori, it is a great dish so thanks to you for the inspiration!